2010 has been a great year for figure skating. 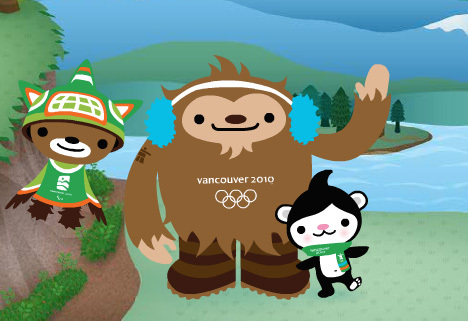 The Vancouver Olympics were absolutely amazing and it’s sad that the year is about to end. Let’s hope that 2011 will be just as amazing. For now, let’s stroll through memory lane and think of a few good times in 2010. So Russian Nationals was this week and there were a few interesting developments. Volosozhar and Trankov won the pairs competition and they look to be a pair to look out for next year. Bobrova and Sloviev won the ice dance competition although the baby Russians, Ilinykh and Katsalapov lost silver to a relatively unknown team whose names I probably can’t pronounce. These two did not have the meteoric rise that I thought they would have this season but next season might be the beginning of a fruitful career. The Russian men are a non entity so I’d have to say that the most exciting competition belongs to the Russian ladies. Ksenia Makarova failed to defend her title as National champion as it was taken away by a young and talented lady by the name of Adelina Sotnikova. Adelina has a long way to go before she can even reach last year’s junior world champion, Kanako Murakami, though both of them lack polish and performance quality. She also doesn’t seem to be very tight in the air, which I’d like to see corrected. I wonder if she can manage those jumps once her growth spurt hits her because I’ve got a feeling it’s going to hit hard. It would be a pity if that happened because she’s such a classic Russian balletic skater and she’s very elegant for her age. I hate the dress for her SP. It makes her look so immature and just simply juvenile. Anyways, onto another topic. Elizaveta Tuktamysheva – a diva on ice who got buried in the SP and made a comeback in the LP, undoubtedly, with some help from Papa Mishin. Despite Mishin’s choreography, I can’t help but like Johnny Weir’s twin sister Elizaveta. All she has to do is look at the camera and you can tell that she just spews star quality. I just wish that she would move to another – bigger and better – figure skating mafia don coach, in other words, Tatiana Tarasova. Tati can take her star quality and turn it into something great, not to mention Liza is in need of good choreography. I think she’d be able to pull of Bells of Moscow better than Mao… Or even the Masquerade Waltz. I’m shivering from excitement as I’m imagining it. So please, Liza, do a Yagudin and go to Mother Tanya. Aunt Joyce has all the videos for the ladies short and long programs on his blog. Tatiana Volosozhar and Maxim Trankov have only been partners for half a season but they’re making significant progress on the Russian pairs skating front. Their unison, technicality and flow is extremely impressive for a team that has just gotten together. (They also beat Kavaguti and Smrinov by a mile at Russian Nationals.) Then again, both Tanya and Max were very talented with their previous partners. I can see this team go very, very far once they arrive on the international scene next year. Sochi 2014 might be their Olympics to lose considering that there’s been a lack of *really* good pairs skaters that have the tricks *and* chemistry since the implementation of the CoP system. If they were able to compete now, I’d rank them above Pang and Tong who are having trouble this season and they might make Savchenko and Szalkowy sweat a little bit. In any case, let’s take a look at their progress (and the speed of their progress). Men: Takahiko Kozuka, Daisuke Takahashi, and Yuzuru Hanyu. 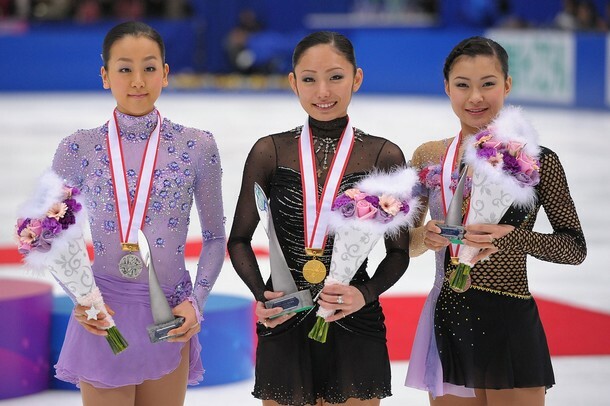 Ladies: Miki Ando, Mao Asada, and Akiko Suzuki. So the results of the ladies competition for Japanese Nationals are in. With great heartbreak, I must announce that the new Japanese National ladies champion is Miki Ando. Mao placed was 10 points behind Miki in the free skate and dropped to 2nd place and though Akiko Suzuki was 4th in the free skate, she lost a bronze medal to the new rising star, Kanako Murakami. As a result, Akiko has lost her spot at Worlds but has a spot at the Four Continents. At least she has another chance to compete this season. That Fiddler in the Roof LP is wonderful. The Reeds and Takahashi/Tran are in both competitions, of course. Mao seems to have recovered from her poor performances on the Grand Prix circuit. The only major mistake in her short program at Nationals was 2-footing her triple axel. The smile on her face at the end of the program said it all. Oh Miki, you are a good skater with a lovely personality… please get better choreography. Kanako lost concentration and singled her axel. Akiko’s skate wasn’t too bad. Just an underrotated and stepped out of a 3Lz. Daisuke has secured a position on the podium after finishing 4th in the SP. He recovered in the free skate and ended up with bronze. The Japanese though, have a new National champion… Takahiko Kozuka! Nobunari Oda finished in 2nd, obviously.